There were doubts Apple would refresh its full-size tablet, but the company has delivered a fourth generation iPad with a faster A6X processor, quad-core graphics and Lightning dock connector while maintaining prices across the board. A palpably faster device at the same the price, a move certain to increase the pressure on the competition. Again, these upgrades don’t represent a quantum leap forward, yet the much faster A6X processor coupled with 2X faster graphics will deliver a noticeable performance increase as the device transitions from the old 30-pin dock connector to the company’s ultra-compact 9-pin Lightning port. Apple could very well have just delivered the connector upgrade without any other changes, but they’ve chosen to essentially double down ahead of the all important Christmas shopping season. 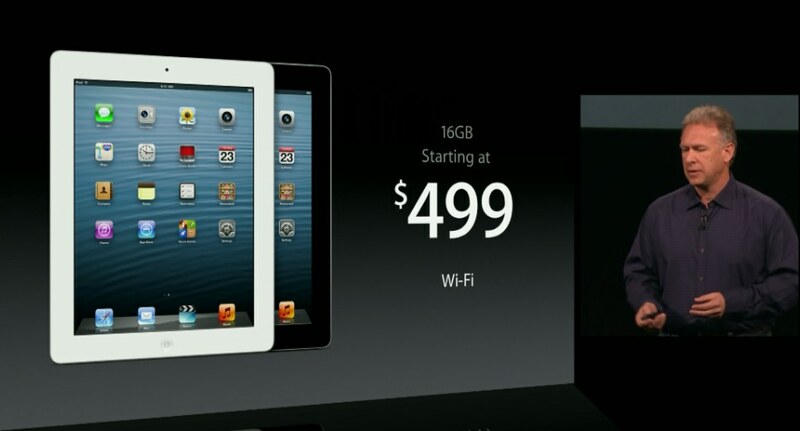 So, do you want to buy one or are you hating Apple for introducing a faster iPad so soon after you bought yours?